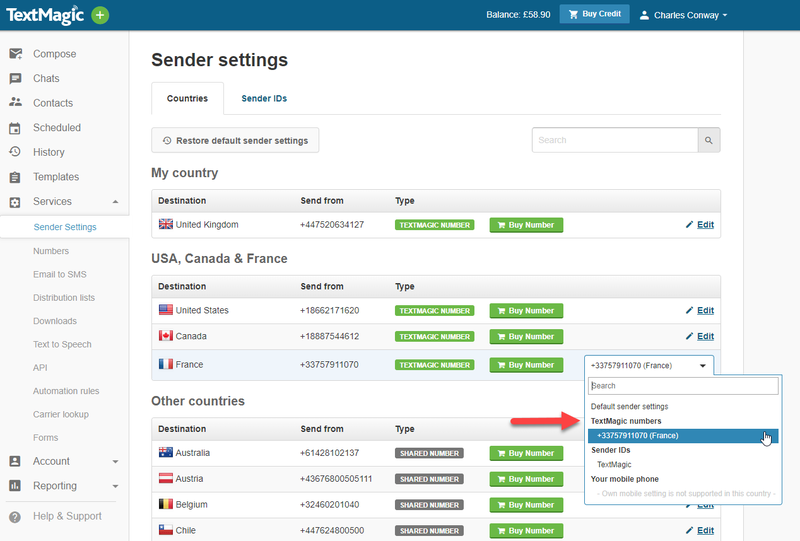 TextMagic uses a Tier 1 direct connection when sending text messages to France using a Sender ID (your business name) or a local virtual mobile number. Before you begin sending text messages to France, please see the following answers to the most frequently asked questions. Why were my messages to France rejected? Sending text messages to France is only allowed using our dedicated virtual numbers or a Sender ID. Unfortunately, it is not possible to use a free shared number or your own number in France. Messages will be rejected if you use an incorrect sender setting or if you contact has opted out. What type of messages can I send to France from a French virtual mobile number? Only real person-to-person traffic - messages that require responses - can be sent from a local French number. Outbound messages from French long virtual numbers are limited to one SMS every two seconds. What type of messages can I send to France from a Sender ID? You should use a Sender ID for sending SMS that do not require a response, such as one-way notifications, reminders and alerts. I have multiple team members who want to send messages to France using TextMagic. What setup would you recommend? Learn how to invite team members to TextMagic. How do I edit the sender settings? Select Services and then Sender Settings from the main menu. Find France in the list. Choose the Sender ID or a local number, depending on your situation.